Christmas memories abound in my head. Foremost among all the warm and fuzzy childhood memories are the images of our Christmas Tree. Early childhood: Dad would buy a spindly tree for $1, and then he would transform it with lights, ornaments (I still have some of them), and loads of tinsel draped strand-by-strand on each of the branches. 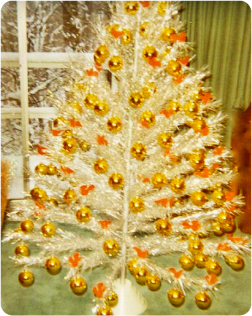 Adolescence: Like so many others, our parents bought into to the fad of having an aluminum tree, with gold ornaments and rotating lights that changed color from blue to green to red to gold. I’ve always loved staring at the lighted tree and all the presents piled underneath it. The hoopla about Santa coming down the chimney, etc., was totally disregarded in our household — my no-nonsense parents wanted full credit for having bought and wrapped those gifts. It’s a good thing I have strong memories about past Christmas Trees, because I haven’t been inclined to put up a tree for the past 6 years or so — it just seems like such a hassle! 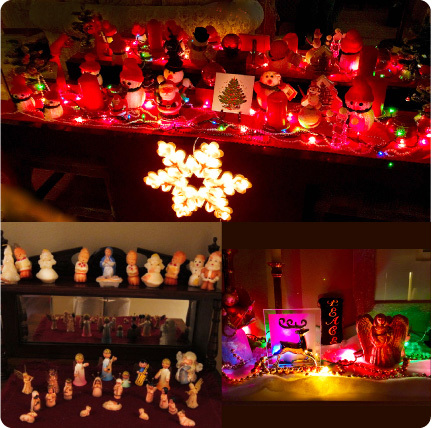 But I do like to decorate the living room with lights, candles, snowmen, miniature trees, figurines and trinkets that I’ve accumulated over the years. Many of these have survived from my childhood, and it’s fun to recall the many years of holiday joy they’ve given me. They’re almost the same age as me and still in near-perfect condition (just like me, ha-ha)! That really puts me into the Christmas spirit! It also gives me pleasure to have the outside of my house looking as gaudy as possible! I remember those aluminum trees and I used to love the tinsel mad of lead that you could roll up into dense little balls. Thanks for the memories!